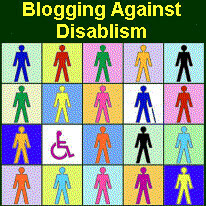 This post is a part of Blogging Against Disablism Day. For most people, health is not life’s goal. Public health is not a religion, or, as recently seen in the United States of America, health is a journey, not a destination. Health is a means to an end, it is a resource for living the full life, not something to be pursued in an obsessive way that denies risk enjoyment and testing limits. How many people with disabilities participated in Australia’s 2020 Summit? According to the Australian Bureau of Statistics, 19% of the young (aged 5-64) population have disabilities, and numbers are much higher after retirement age. If people with disabilities (PWD) are considered full citizens and had proportional representation at the Summit, of 1000 working-age participants, you might expect nearly two hundred people with disabilities having their say at the Summit. Of people with disclosed or visible disabilities, however, the current count seems to stand at less than ten. According to one source, there were six. The fact that these numbers are difficult to obtain shows how important this issue is in the able-bodied national psyche. On this information, that’s PWD underrepresented by a factor of thirty. How many protests would there be if there had been only 16 women at the Summit? The country scrutinised gender inclusion closely and at length, both in the mainstream media and in the blogosphere. This disablist inequality puts that to shame. You can download the Initial Report of the Australia 2020 Summit here. The report opens with “The Productivity Agenda”. The focus on a competition economy labels us as marginal citizens, if we are not economically useful. We are primarily a problem for capitalism, a burden to be reluctantly dealt with. We are not seen as people with thoughts and ideas and lives, people who have their own perspectives and contributions to Australia’s civic society and cultural life.